Well, I'm stumped on this old dog. 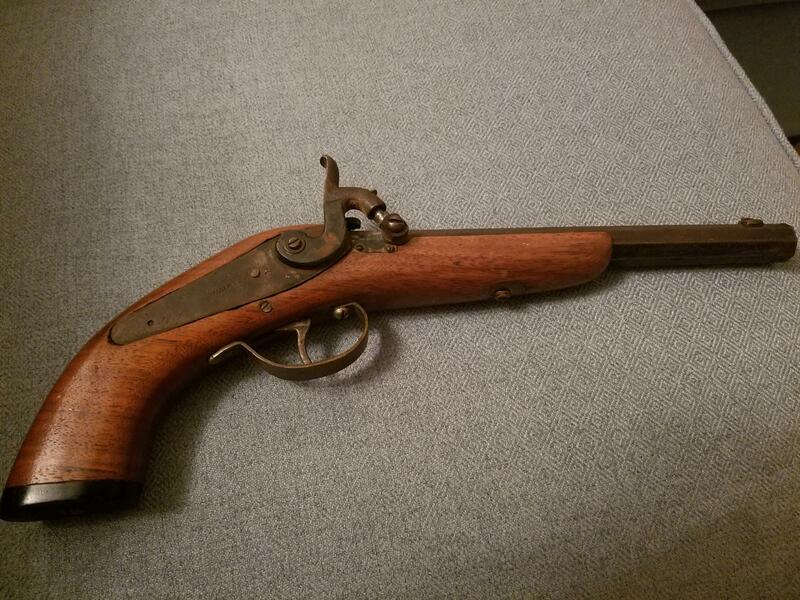 So Im posting this here to see if anyone can either help identify this pistol, or at least direct me somewhere where I can find some info on it. 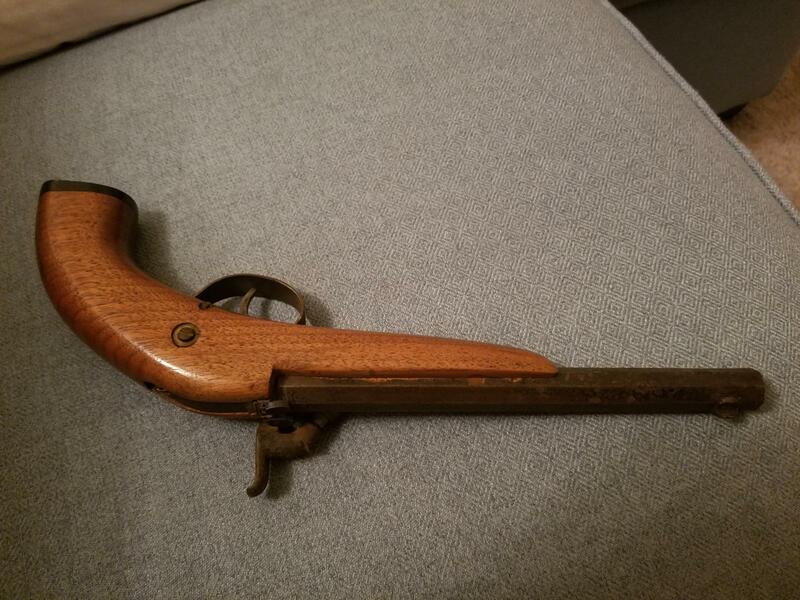 My friend brought this by me to see if I could help find a bit of info on this firearm, but I cant seem to find much of anything. Obviously it has "Richards" stamped on the side of it. But every search I do for Richards percussion pistol brings me to Westley Richards. And none of those pistols have a lock work like this one, and the Westley Richards percussion pistols all seem to be high quality. This thing is definitely not high quality. The rear tang looks like it was profiled by a drunk man using a rock as a file. Ive opened everything up on it and the only markings are the "Richards" stamp on the lock. The bore measures .317 and it is smooth bore, no rifling. But it is a little rusty, so I am assuming that it is actually a .32 cal and the rust is just messing with my measurements. It does have a set of Marbles sights on it that are installed into dovetails that were spot welded to the gun. So its got that going for it! Any help or direction to somewhere/someone that could help will be much appreciated! Edited by skrapyard, 13 August 2018 - 02:56 PM. Maybe contact them and ask. Maybe they could point you in the correct direction. Edited by spec5, 13 August 2018 - 04:47 PM. That is actually very helpful. I dont usually deal with antique or black powder guns so that is some great information. According to that it would seem this is either one very crappy forgery of a high end gun, or its just some other gunsmith that stamped their name onto this. I will have to keep digging for info though since I would like to try and figure out at least where and when this gun was made. This is probably a gun smith special, it certainly could be a Richards lock but it might not have come from a handgun and it's a conversion. The problem with early 1800's firearms there's a whole lot of people making them and "nothing" goes to waste and pieces are often reused. There were also some gunsmiths that made certain parts and will have their markings on them but assembled into firearms by other gunsmiths. I guess the big one that comes to mind is Remington, he made a whole lot of barrels (marked) but "E" didn't make a flint or percussion rifle. You won't find anything about that exact gun, because it's a one of a kind that somebody cobbled together in their garage. The back action lock may have come from an old shotgun. The trigger guard is obviously a simple bent piece of sheet metal. The trigger doesn't look old. Stock amateurly carved from a scrap of walnut. Who knows what the barrel came off of... And the spot welded sights just confirm everything. It could be a stage prop. Well, the more I search, the more it seems to just be a backyard gunsmith project that was crudely cobbled together by someone. I will admit I'm still curious what firearm the lock work came off of. And as silicon sorcerer and the possum said above its probably not from a pistol. 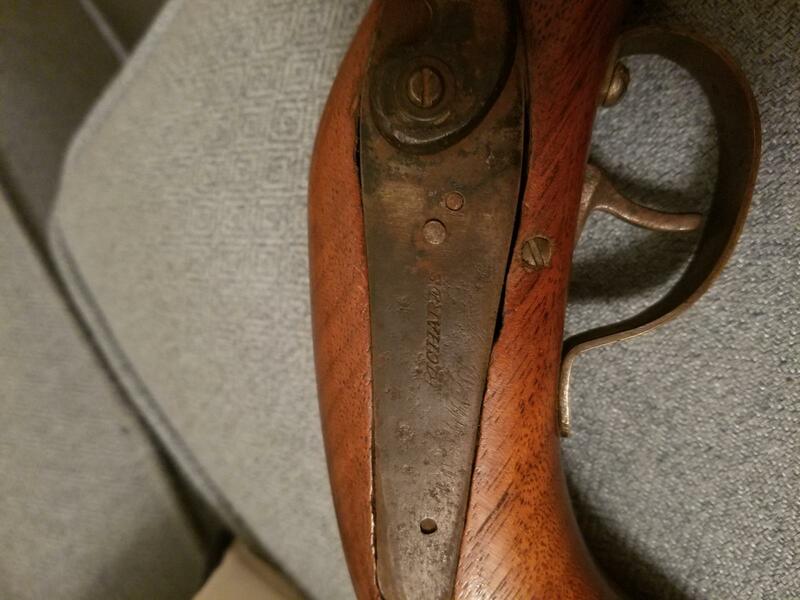 Most likely from an old shotgun, or possibly a rifle. It seems quite large to have originally been from a pistol. Its going to bug me that I cant find an answer to exactly where it came from, but I dont want to go too deep into the rabbit hole to figure that out either. Black powder/muzzleloaders are definitely not something I know much about other than how to load and shoot them. Ive never had much interest in them other than occasionally bringing out the old flintlock kentucky rifle replica for giggles at the range. Thank you to everyone who chimed in here. It was good to hear some thoughts on this other than whatever google and my brain were coming up with. Time to go dump some FFFg into it, cram a 32cal ball and patch in and see what happens!!! Edited by skrapyard, 16 August 2018 - 02:52 PM. Tie it to a tree, put a string on the trigger, and a give it a yank. It's not going to blow up unless you go crazy. If you want a measure put a ~32 case full of powder in it, I suspect you could push that but first shot you only want to make sure the lead comes out and nothing else bad happens. Also if your looking at images for a match, try looking for one with a flash pan and ignore the hammer. That hammer looks a bit "Belgium". I collected a long time but I stayed in the 1850-1899 range, no flash pan firearms. Many people don't realize the 22 was invented in 1857 by Smith & Wesson, first firearm to use it was the Model 1, Remington wasn't far behind, with the Elliot's ZigZag Derringer, I suspect Sharps and others also weren't far behind. Truthfully, Im not afraid to give it a shot by firing it this way. But its not my gun. The person who brought this by me to take a look at it is also not...umm...how can I put this nicely...they are not very safe with things. So I dont really want to put them on the path of playing around with black powder. Lol. I suspect it is a not so old kit gun. Smooth bore seems odd. Black powder pistols start load with half the caliber in grains. Not really odd, remember the good old Springfield Model 1842 rifle was a smoothbore.